Info "Use up all the toilet paper! What? Not environmentally friendly, you say? Sorry..."
Paper Trail is one of WarioWatch's microgames in WarioWare: Twisted! 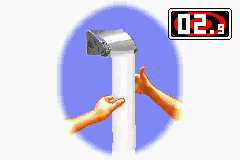 The purpose of the game is to tilt the Game Boy Advance rapidly to roll out all of the toilet paper. 1st level difficulty: Unroll a short roll of toilet paper. 2nd level difficulty: Unroll a long roll of toilet paper. 3rd level difficulty: Unroll a longer roll of toilet paper. This page was last edited on November 17, 2018, at 03:10.